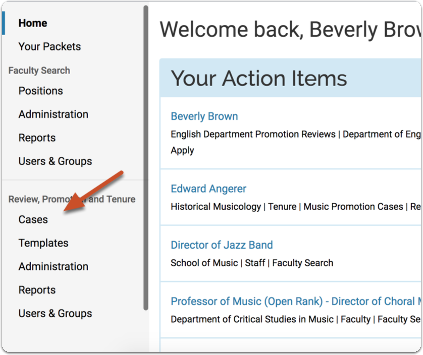 Administrators and Committee Managers in Interfolio Review, Promotion & Tenure can add materials to a case, including candidate documents, committee documents, and external evaluations. 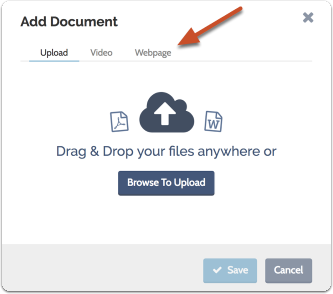 It is possible to upload most popular document formats, as well as links to videos and web pages. 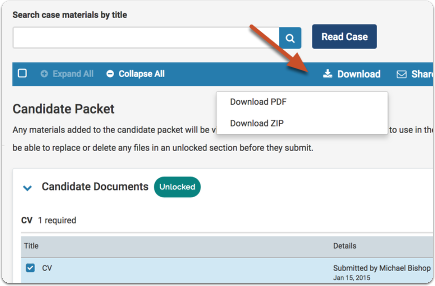 Administrators and Committee Managers may also set permissions for viewing and downloading case materials, and set the packet section in which materials will appear on the case page. 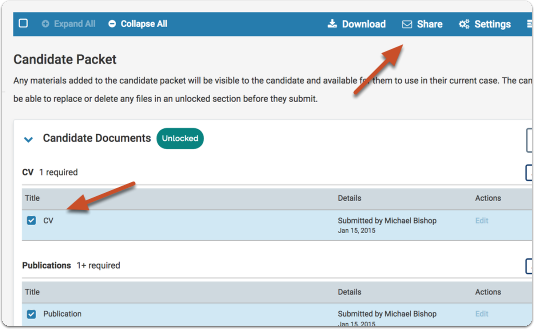 It is also possible for Administrators and Committee Managers to share packet materials with Committee Members or candidates. Note that external evaluations cannot be shared with the candidate. 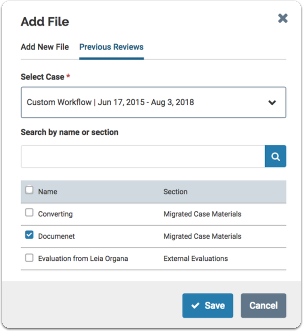 This article explains how to add and manage materials from the case page. 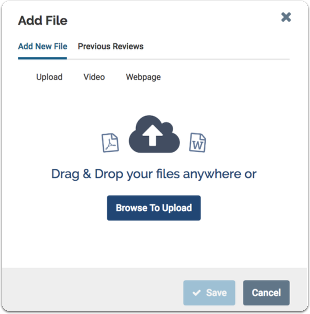 Click to browse and upload files, or drag and drop. We accept .pdf, .doc, .docx, .xls, .xlsx, .txt, .ppt, .pptx, and .html files. You can also link to videos and web pages. 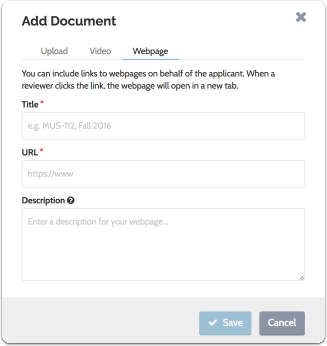 Note that you can now include files from a previous review of the candidate. RPT administrators setting up a case for a faculty member can access and add documents from a previous review for that same faculty member. 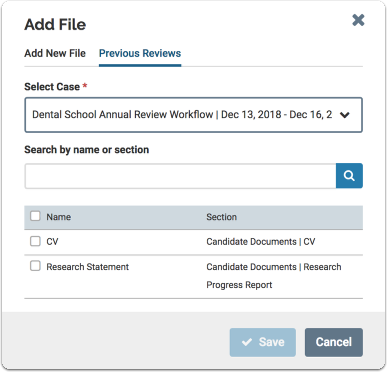 If there are previous cases associated with the candidate, the admin will see a “Previous Reviews” tab and have the option to add a file from a previous case. RPT administrators searching for previous reviews will not see cases for which they are recused. The admin can search the list of applicant media from the previous packet by name or the packet section name. The admin can then select and copy one or more applicant files from the previous packet to the current packet requirement. The admin has an option to select all documents listed. RPT Administrator selecting documents from a previous review for a future review will not see External Evaluations / candidate attachments as available artifacts. 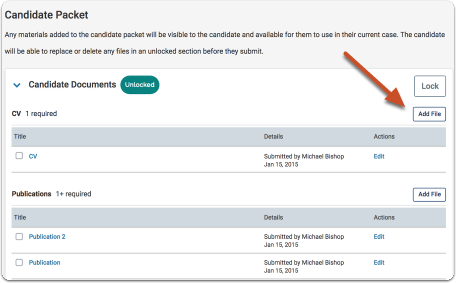 Candidate Side: If the candidate has been notified of their case, when an RPT Admin or CM adds a new artifact to the candidate requirement section, they will get an alert notice that tells them the file will be visible to the candidate and asks them to confirm they want it added. If user selects yes, then the file will be added to the packet. An administrator can upload a document as a fulfillment to a requirement on behalf of a candidate. These documents are added to the candidate’s dossier. 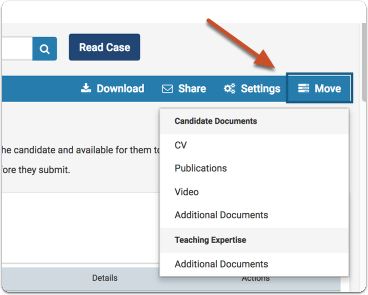 Once a document is moved or added to the Candidate Documents section on the candidate packet, it cannot be moved out of that section. 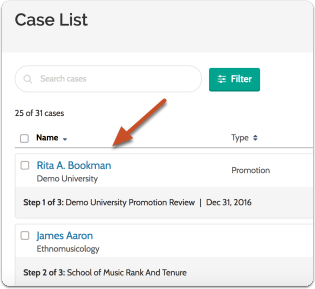 We now display the name of the individual responsible for adding an artifact to a packet on the case page of a candidate. Note: We have moved this information from the document edit window and placed it beside the document on the case page of the candidate. An RPT administrator can remove a document added by an admin as a requirement fulfillment on behalf of a candidate. 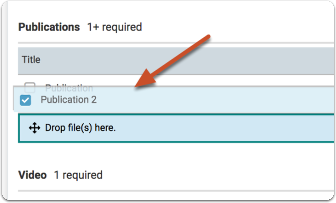 An RPT CM/Admin can reorder and reassign selected files to a Candidate Requirement Section (Note: User can also move documents in bulk). 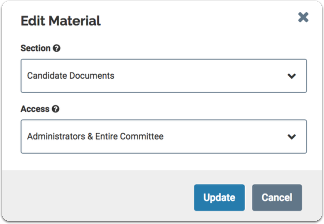 RPT CM/Admin can use the new Actions Bar to select and move one or more packet attachments or packet links (individually or in bulk) from an Internal Section to a new target Candidate Requirement Section, and those materials become applicant documents or links. We follow an existing pattern for not allowing the selection of a Section. Administrators can move fulfillment from one required document to another in the same packet. Fulfillment can only be moved to and from required document. Applicant can also move fulfillment from one required document to another, and fulfillments can only be moved to and from required document. Admin or CM can move packet section document from one internal section to another. You can turn downloading on or off (if downloading is allowed by your institution) or set the access level indicating who can view the files. 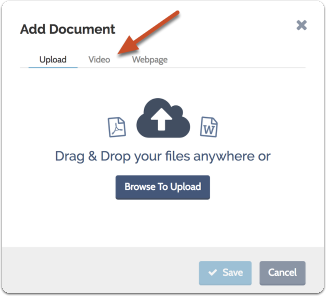 Click "Download" at the top of the page and choose to download a PDF or ZIP file. We will send you an email with a link to your documents. Note that candidate's can not see committee facing packet materials unless you share the materials with them, and candidate's can never see external evaluations. 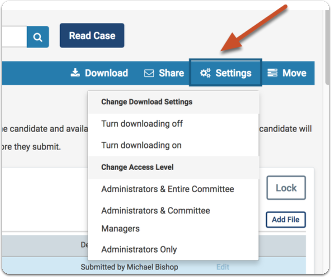 Select one or more files to open the action bar at the top of the list, then click "Share" and choose to share the selected materials with the candidate or Committee Members. 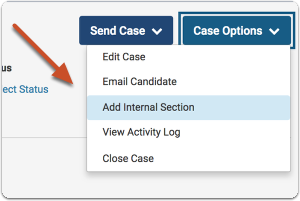 Select the materials you want to move, click "Move" on the action bar, and select the new section for the materials from the dropdown list of case sections. 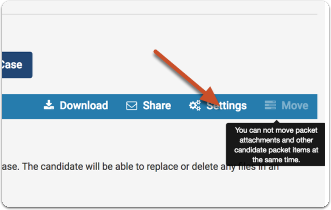 When an RPT administrator or committee manager selects one or more documents in the internal sections, AND one or more document in the candidate packet, the "Move" button is disabled with a message that says "You can not move files between the candidate packet and internal sections. " Administrators and Committee Managers can add internal packet sections from the Case page. See here for more detailed information about creating custom packet sections. 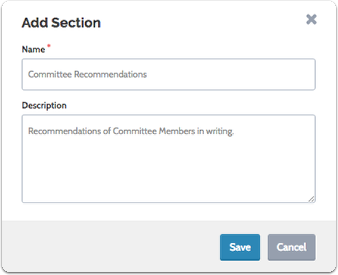 Click the "Case Options" button at the top right of the list and select "Add Internal Section"
"These sections are available to committee members reviewing the case and cannot be viewed by the candidate. Please note that some materials added to internal sections can be shared with the candidate by an administrator or committee manager." 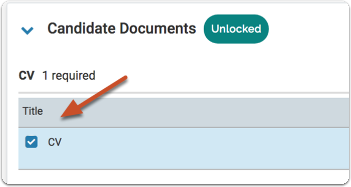 When unlocked, candidate editing is enabled, and the candidate can add, edit, or submit materials for the section. 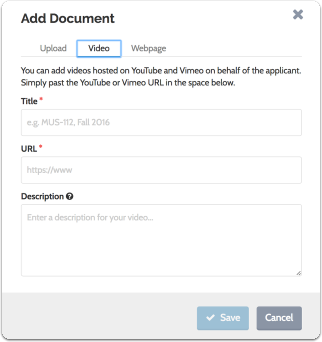 When locked, candidate editing is disabled, and the candidate can not add, edit, or submit materials for the section.